Redstar Equipment introduces their range of arc welders with the DAW-500S, which features an innovative power generator with a permanent magnet, as well as a current control system that offers stable arc performances for all sizes of welding rods. 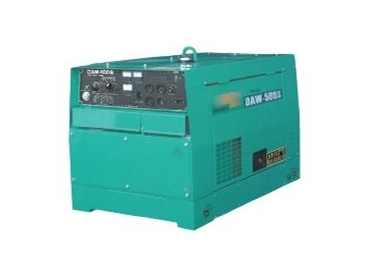 The DAW-500S Arc Welders power generators are more efficient, compact and lighter than their predecessors with a 20% reduced engine output requirement. The power generators incorporate a brushless permanent magnet and field coils that help greatly reduce its overall weight. The power generators also feature a built in slow-down unit to help increase fuel efficiency and improve its arc welding performance. The DAW-500S Arc Welders come with standard safety devices, such as an emergency shut-off device to protect the generator from welding output overloads, low oil pressure, high water temperature and insufficient battery charges. The DAW-500S Arc Welders, available from Redstar Equipment, are ideal for pipeline construction and other heavy duty projects.